“Seaweed is ancient and basic, a testament to the tenacious beginnings of life on earth,” writes Susan Hand Shetterly in this elegant, fascinating book. “Why wouldn’t seaweeds be a protean life source for the lives that have evolved since?” On a planet facing environmental change and diminishing natural resources, seaweed is increasingly important as a source of food and as a fundamental part of our global ecosystem. 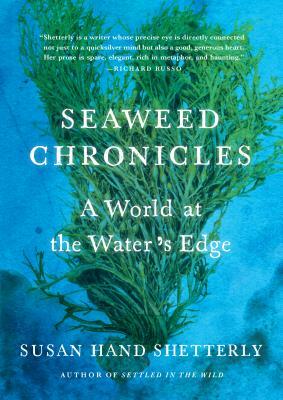 In Seaweed Chronicles, Shetterly takes readers deep into the world of this essential organism by providing an immersive, often poetic look at life on the rugged shores of her beloved Gulf of Maine, where the growth and harvesting of seaweed is becoming a major industry. While examining the life cycle of seaweed and its place in the environment, she tells the stories of the men and women who farm and harvest it—and who are fighting to protect this critical species against forces both natural and man-made. Ideal for readers of such books as The Hidden Life of Trees and How to Read Water, Seaweed Chronicles is a deeply informative look at a little understood and too often unappreciated part of our habitat. Susan Hand Shetterly is the author of the essay collections Settled in the Wild and The New Year’s Owl, as well as several children’s books including Shelterwood, named an Outstanding Science Trade Book for Children by the Children’s Book Council. Shetterly has received a nonfiction writing grant from the National Endowment for the Arts and two grants from the Maine Arts Commission.